Water Vapor in Vacuum Systems - Meyer Tool & Mfg. When the walls of a vacuum chamber are exposed to air, the surfaces become coated with layers of adsorped water. The amount of water adsorped will depend on the partial pressure of water in the air and the duration of exposure. Water is often present in tens of monolayers on a metal surface. The time required for a surface that is initially clean to reach complete saturation with adsorped water can be many hours. A molecule of adsorped water can leave the surface if it has enough kinetic energy to overcome the attractive potential. This process has a characteristic activation energy. Outer layers of water molecules adhere relatively weakly to inner layers of other water molecules. However, the innermost layer of water will generally have a much larger binding energy with the surface of the metal and be much harder to remove. Chemisorption is adsorption characterized by very high binding energies and an interaction between the adsorped molecule and the surface that is similar to a chemical bond. Physisorption most closely resembles condensation; the molecules are only weakly attached to the surface. The outer layers of water on a stainless steel surface would be characterized as physisorped while the innermost layer is chemisorped. Removing the water vapor from a system is often the largest impediment to reaching a good vacuum. 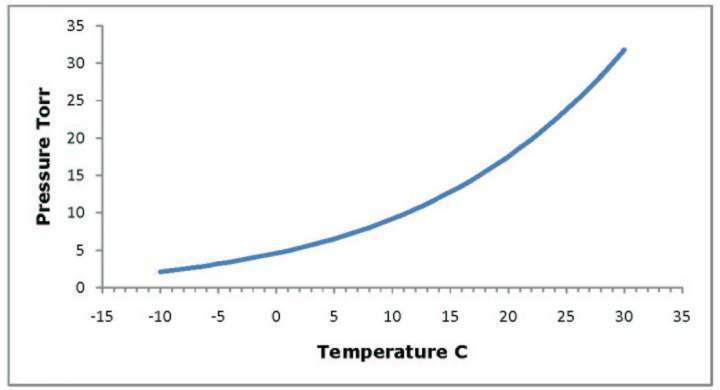 The vapor pressure of water is 24 Torr at 25°C (77°F). Strictly speaking, the vapor pressure is only meaningful when we have vapor in thermal equilibrium with the actual liquid. However, when the film of water is many tens of molecules thick, the conditions in the outer layers approach that in the bulk liquid. The energy required to remove a molecule of water from an outer adsorped layer is about the same as the latent heat of evaporation of water, around 10 kcal/mole. When we begin pumping on a chamber which has been exposed to atmospheric moisture for an extended period of time, it is as if we were pumping on bulk liquid. Initially the noncondensed gases are pumped out rapidly and the pressure in the system falls exponentially. However, when the vapor pressure of water is reached, water molecules begin to desorp from the surface and the rate at which the pressure is reduced. Heating the surface will cause water to be desorped more rapidly and reduce the ultimate pump-down time. The presence of rubber o-rings, indium seals, or other temperature sensitive materials may limit the bake-out temperature. A standard bake-out at 300°C (572°F) is required to remove the innermost chemisorped layer of water from stainless steel. If a quick pump-down time is important, the amount of water adsorbed can be minimized by minimizing the surface area through the use of smooth, polished walls on the interior of the chamber. Striking a glow discharge in the chamber as it initially pumps down through the 10 Torr to 0.1 Torr range can aid in removing water vapor from the walls by ion bombardment. Both argon and air have been used for this purpose. A very simple measure to reduce the presence of water vapor, but one that is often overlooked, is to keep vacuum chambers pumped out when not in use. Normally a chamber will need to be let up to atmosphere before use in order to load samples, sources, targets, etc. However, a brief exposure of a few minutes will result in less adsorbed moisture than an extended exposure. This practice can reduce pump-down times considerably. A Meissner trap is a coil of tubing, through which refrigerant flows, placed in the vacuum chamber to freeze out water. This provides a very quick pump-down; however, having ice in the vacuum chamber may not be suitable in every application. The coil must be warmed up before the chamber is opened. Water vapor adsorped to the walls of vacuum chambers is an issue for almost every vacuum system, and is normally the major contributor to the pump-down time. The vast majority of vacuum chambers must be opened to the atmosphere as part of their operation, making adsorped water practically impossible to avoid. There are also other potential sources of water in vacuum systems. For example, the combination of metal oxides with hydrogen may be a factor in ultra-high vacuum systems. Meyer Tool has over forty years of experience in vacuum technology. While problems such as water vapor cannot be avoided completely, we work with customers to make these problems manageable and to avoid surprises. ​We hope that you will make Meyer Tool your source for custom vacuum chambers and equipment. If this article was of interest to you, drop us a line and let us know. Your feedback will help us determine what type of content you would like to see in our newsletter and posted to the website.